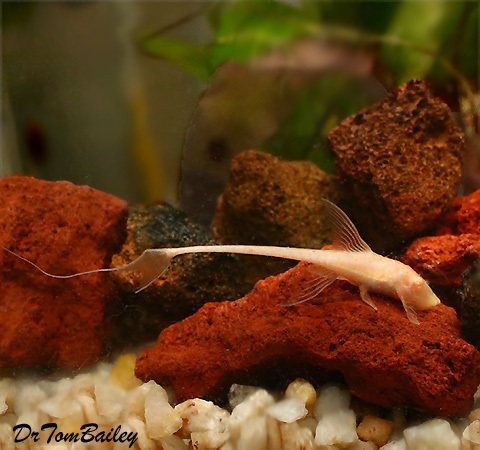 Above: this picture shows a nice young Premium Quality Albino Farlowella Catfish swimming in one of our aquariums, when one of us snapped this picture. Comments: This is a Premium Pet Fish, and we never see Premium Fish like this in any of the live fish stores or the online stores that we visit. These Premium Pet Fish are more energetic, hardier, and have brighter colors with a beautiful metallic sheen. Origin: This catfish's ancestors probably lived in western Panama, Equador, or Columbia. This fish was raised by fish farmers and now lives in aquariums all over the world. Maximum Size: This Catfish can grow to be about 8" long, including their tails, which are long. Compatibility: Some recommended tank mates include Tetras, Cory Catfish, Angelfish, and other mild tempered community fish. Temperature: They live well from about 75 to 82 degrees F., but they're probably most comfortable at about 78 degrees F.
Water Conditions: This Catfish seems to be tolerant of a wide range of water conditions. Probably a pH of about 7.0 to 7.5 with moderate hardness is best. Their ancestors lived in rapidly moving water, so they need vigorously moving water and frequent partial water changes. Aquarium Size: It is probably best to house these fish in at least a 30-gallon tank, when they're less than 3" long, but a bigger aquarium is always better. Allow at least 5-gallons of water for each Catfish under 3" long. They'll grow rather slowly. At about 3" they should be moved into a 60-gallon aquarium. Live Plants are beautiful and improve the water quality and these catfish do better in an aquarium with live plants. Aquarium Filter: Bio-Wheel Filters are highly recommended. A Penguin 200B Filter in an aquarium with 30-gallons of water is OK to start with a few of these Catfish that are less than 3" long. Life Span: These Catfish can live for several years, probably many years provided they are fed premium food and kept in a large aquarium with very fresh water. Breeding: This fish is an albino that has been spawned in an aquarium. Apparently they are not too difficult to breed. Popularity: This Catfish is rare and not often seen. Names: The scientific name is Farlowella vittata. Variations: This Catfish is a variation of the Royal Farlowella.